It was established in Japan by Dr. Usui in the 20 century. In Japanese Rei is Universal energy and is based on the ancient character for rain. Ki is the character for vitality or personal energy, this translates to Chi in Chinese or Prana in Sanskrit. Reiki is the Universal Energy raining down onto the vitality or life force in the individual being. It was established by Dr. Usui in Japan. It is a powerful and sacred tool for healing, balance and spiritual development. 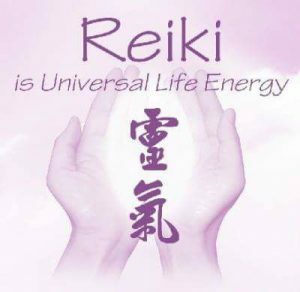 It is a safe, non-invasive and non-denominational form of healing in which Reiki is channelled through the hands of the practitioner and made available to the client’s own energy system to boost the vitality of the individual. Eases stress and tension, promotes deep relaxation. Moves blocking energies, allowing our energy to flow freely, re-establishing our natural equilibrium to bring physical, mental, emotional and spiritual well being. Accelerates the healing process by supporting the body’s own natural ability to heal itself. Opens the self to new levels of awareness and clarification. Encourages to let go of all tension, anxiety, fear or other negative feelings. Would you like to have a Reiki session? Before the Reiki session, I prepare by meditating alone for an hour to centre myself and to be a channel of Reiki for your session. The fee is £55 per 1 hour session. During the Reiki healing session, you lie on a couch fully clothed. Depending on your preference, I will place my hands on or near you and let energy flow from my hands to you. You don’t have to have a problem to get the benefit from Reiki. Each Reiki session is different and can’t be controlled. There is no good or bad session, Reiki gives the person exactly what they need in that moment depending on their current state. Everyone has a different reaction from Reiki, some people may feel very relaxed even fall asleep. Some may feel heat or tingling, some may see colours and feel somehow emotional. Some aches and pains may come to the surface. This is all perfectly normal.